How Do I Find Home Lighting Solutions That Are Right For Me? Home lighting design is one of the most important aspects of making your home beautiful and setting just the right tone for your rooms. Unfortunately, most interior design magazines and websites make the same mistake: they say almost nothing about home lighting design. If you take a look at your favorite interior design magazine, you’ll notice something interesting: the lights are almost always off. Aside from the occasional lamp or other accent light, photographers don’t try to represent actual lighting in those magazines. Instead, they reduce lighting design to picking lighting fixtures as though they were furniture. True lighting design is completely absent. Homelightingtips.org takes a completely different approach. Step by step, room by room and fixture by fixture, we show you how to easily integrate your lights and lamps into an overall plan for your rooms that illuminates every aspect of your interior design. How we light our homes shapes how we see our homes, and we help you to make the choices that are right for you. Lighting design doesn’t affect what we see but how we see it. The mistake that interior design magazines make comes from the belief that lighting design is somehow too difficult for the average person to understand. Rather, they seek to provide attractive lighting fixtures and leave the question of how to actually place those fixtures to interior decorators. However, this belief is mistaken. What overall level of light do I want in this room? What colors do I want to bring out in my furniture, walls and other decorations? What kind of contrasts do I want between the brighter and darker areas in my rooms? What kind of shadows and pools of light do I want to use to decorate my rooms? How will this room look in the day as well as the night? And finally, how will this light fixture look as a decoration in itself? By going through this list, it’s easy to make the decisions about lighting design that are best for the style and mood that you want in your home. At homelightingtips.org, you can find information not only about what light fixtures look like, but how best to use them. We concentrate on finding the solutions you need for taking those attractive fixtures and making your entire home more attractive. To do so, we’ve divided the information into sections. Some deal with individual rooms that have their own lighting needs, especially the kitchen and bathroom, which need lighting that can be used for special tasks as well as for general illumination. Others deal with kinds of fixtures that could be used in multiple rooms, and how to use them depending on where they are placed. Finally, there are sections on outdoor and solar home lighting, which need different sorts of strategies to deal with the relative lack of wall and ceiling space. If you’re interested in finding solutions for home lighting that take into account your personal needs and style, you have certainly come to the right place! Bathroom lighting design is one of the most challenging and exciting projects in the home. It requires a balance of the right light for tasks with the right mood. Coming up with the best kitchen lighting ideas is a matter of understanding how all the elements of kitchen lighting work together. Find the best outdoor lighting ideas for turning your outdoor spaces into nighttime spaces. There are a number of ceiling lighting fixtures available that will suit any type of design. 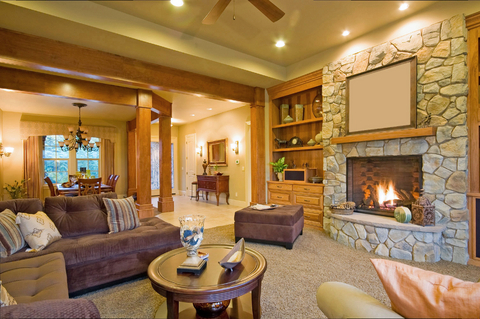 Recessed lighting fixtures provide nearly invisible lighting for your rooms. Track lighting systems provide excellent accent and pendant lighting, but are poor for tasks. Solar powered lighting provides perfectly energy-efficient lighting both indoors and outdoors. Lamp design provides both quality light sources and attractive fixtures. Choose light bulb types that suit your lighting and home energy needs. Natural lighting principles include using lighting phases and maximizing and manipulating light. Light control systems provide both practical and aesthetics lighting options. Hit “Like” for Daily Tips!